Today is 1 Rep Max Deadlift day at WildFire CrossFit. Building strength in the Deadlift is only going to help every other lift we do. Knowing your 1 Rep Max opens the playbook for being able to do a lot more percentage-based lifts. When you can apply the correct 1 rep max to something like 3 sets of 3 at 75%, 80%, & 85%, you will be able to build strength more efficiently because often you are practicing with higher weight for more reps.
Plus, it gives you a goal to shoot for. Adding 20# to your Deadlift over a certain period of time is a great goal! In the beginning, as you learn form and technique and get more efficient with your lifts, the weight you lift will go up more dramatically over a shorter period of time. As you progress, it takes a considerable amount more training to make bigger gains. If getting stronger is a goal, I would strongly recommend a strength program in addition to classes where we focus on General Physical Preparedness. If you want to lift more weight, you need to lift more weight. Depending on what we do in class, what days you come in, and what days you take off, you may go 2-3 weeks without doing a Deadlift or Back Squat which are two of the most important lifts for building strength. Don’t get me wrong, you are going to get stronger and faster by taking class, the point is, if you want to get stronger, faster, you need to be doing the Deadlift, Back Squat, & Shoulder Press every week. There is a simple and structured strength program called the Wendler 5-3-1 program. It works because it’s simple and goes off specific percentages of your 1 rep max. And, it can be done in a short amount of time either before or after class. The other benefit of this program is that it can be done in addition to the Olympic Lifting, Inferno, and Class programming, and still leaves you time to work on the other skills necessary to be the most well-rounded athlete possible. 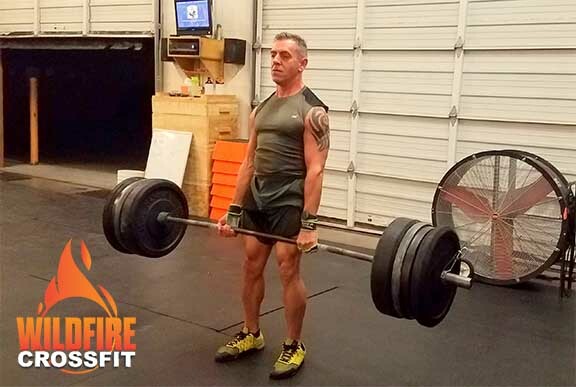 So get into WildFire CrossFit today and get your Deadlift on and get ready to ring that PR bell…and then keep on ringing it as you continue to grow as a CrossFit athlete!